Disclaimer: I hold myself in no way responsible if this post makes you hungry. I’ve only put the pictures together so far but I’ve had to do a little detour to the kitchen for a slice of bread and butter. If you’re reading this while supper cooks, maybe come back later. 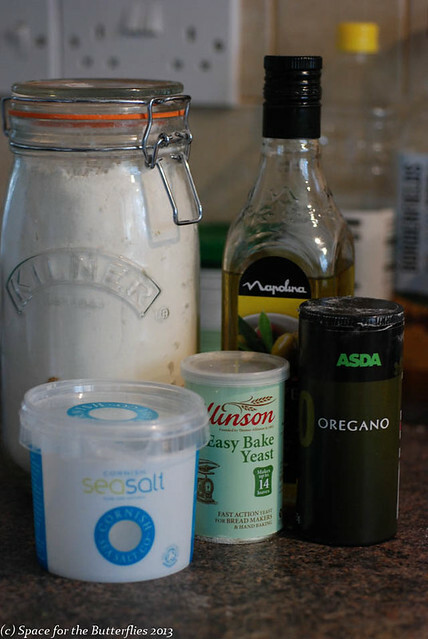 Put the flour in a bowl together with the salt, yeast and dried oregano. Put the salt and yeast on opposite sides of the bowl. Add the olive oil to the tepid water and pour them onto the flour. Mix until it starts to come together as a soft dough, then turn out onto a worksurface and kneed for 10 minutes until the dough is silky smooth. (As just about all prodding and pulling at the dough will help, this is a great step for little cooks to help with; Kit loves playing with it, although I do have to keep a weather eye to stop too much dough disappearing into a tiny tummy). Lightly oil the mixing bowl, then pop the dough in it, cover the top with clingfilm/ damp teatowl/ spare showercap and leave somewhere warm to prove until doubled in size (1-2 hours ish depending on how warm your house is). 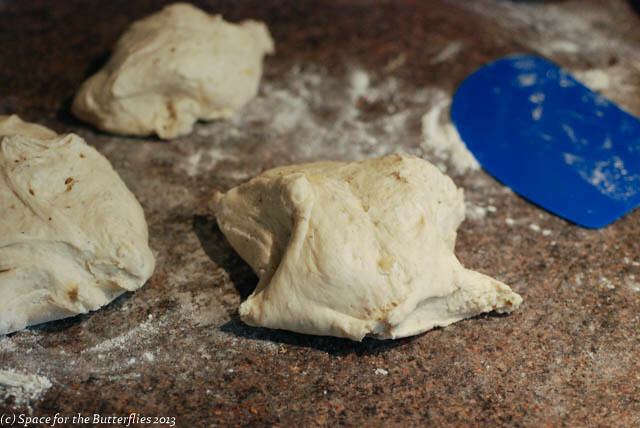 When the dough has risen, tip it out onto a lightly floured worksurface and divide into however many pizzas you want. I make three and we often have leftovers (great cold for lunch the next day). Shape each portion into a ball, then flatten with your hands. 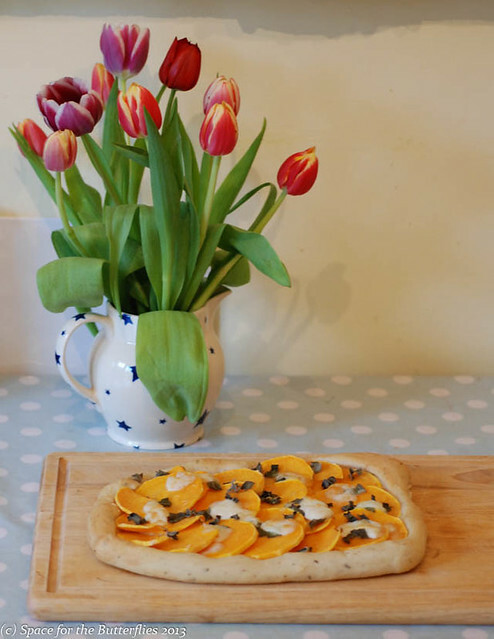 To stretch it further you can either use a rolling pin, or whirl it around in your fingers. We go for the whirling, but we’re not very good so we tend to get slightly wonky pizzas. Place each on baking parchment on a baking tray and set aside. If you don’t have any baking paper you can just use a smidgen of olive oil on the tray; I use the parchment because I only have two baking trays so I need to do a quick change over when I’m cooking, and the baking paper makes that easy. Pre-heat the oven to 200 C and gather your topping ingredients. 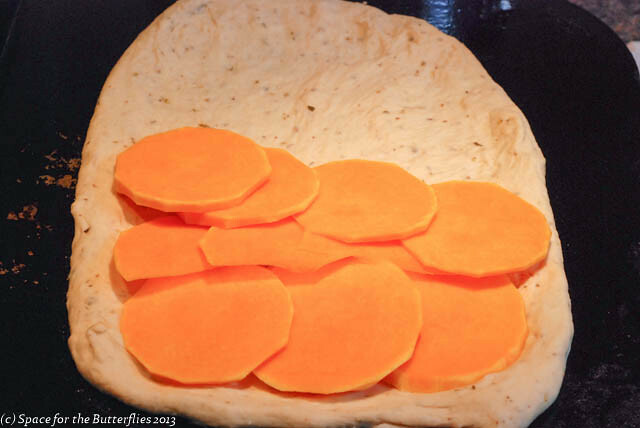 Peel the butternut squash and slice as thinly as you can. They aren’t the easiest things to cut so use the biggest sharpest knife you have. 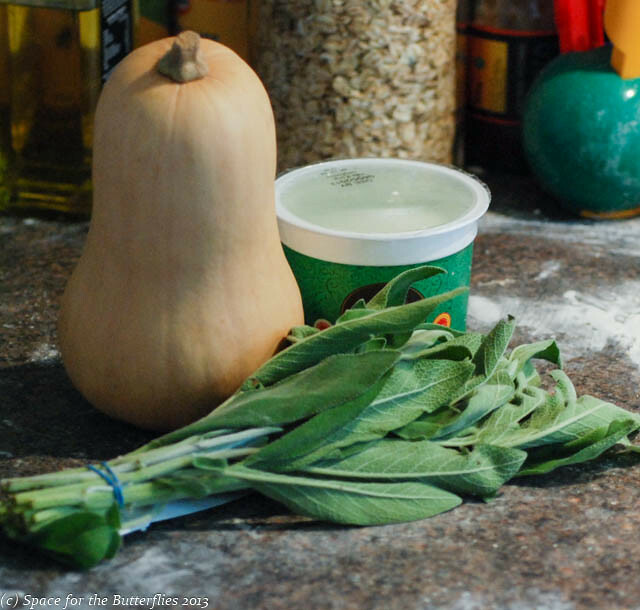 Lay overlapping slices of the squash over your base. 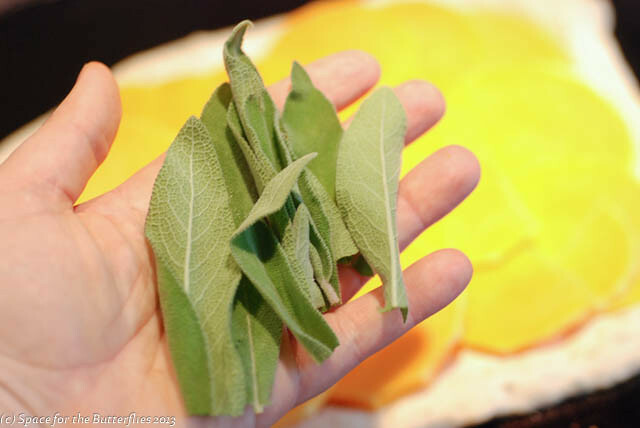 Take a handful of fresh sage, tear it roughly and scatter all over the top. Pull the ball of mozzarella into little pieces and scatter over the top. If you want to, add a smidgen of freshly grated parmesan, and a drizzle of olive oil. Bake for 10-15 minutes. 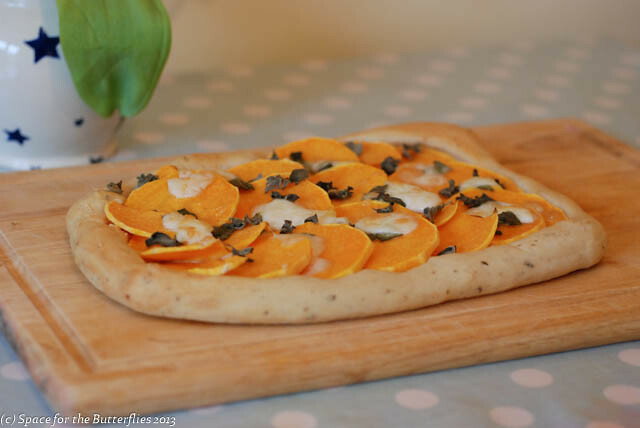 Precisely how long it will take will depend on how thinly your rolled your pizza base and sliced your squash. I find mine usually take nearer to the 15 minute mark, but it’s better to check at 10 mins than end up with burnt pizza. 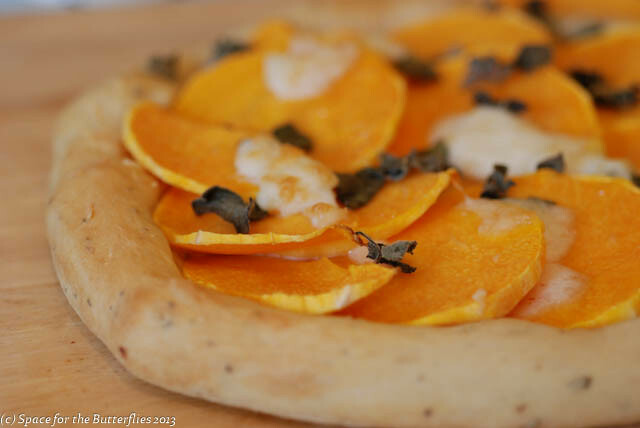 The cheese should be melted and golden, the crust light brown and the squash soft and tender.